The Friends of the Flange : People and Their Pistons: The influence of Geography on Steam Locomotive Design. People and Their Pistons: The influence of Geography on Steam Locomotive Design. Over the years, I’ve amassed a pretty decently sized collection of railroad history related books. Many of them open with some sort of rumination about how the building of the railroads dramatically altered the landscape and changed the shape of the Earth itself. This is undeniably true, but I’ve notice less discussion about how differences in geography influenced the design of the steam locomotives built to roll over the early railroads. Most people interested in trains can distinguish a locomotive that ran in the Americas from one that ran in Europe--in fact, we tend to divide ourselves into camps depending on which side of the Atlantic we favor--but may be unaware that these differences are less cultural preferences than they are specialized adaptations. All of the divergent appearances of these two types of locomotives can be distilled down to one of three factors: Different fuel sources, the distance that the locomotives were required to travel between stops, and whether the nation by which they were designed was at the time developing, or already in possession of an infrastructure and a dense population. So with that in mind, let’s dive right in and get to the meat of the discussion! Here are two different locomotives--the top is the reproduction of the Jupiter locomotive used at the Golden Spike ceremony, the second is a, LB&SCR B4 class. While it should be noted that B4 was designed some 40 years after the heyday of the American type, as this 0-4-4 wheel arrangement came to be known, these two locomotives display enormous variation on the same exact wheel type. 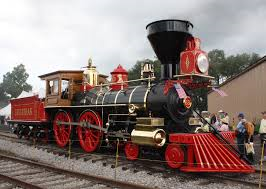 The American locomotives of this time appeared quite a bit more ornate than their British and European counterparts. Let’s start our way at the front, and break these differences down part by part. The need for the cowcatcher is almost self-explanatory. Today much of the American plains are privately owned and fenced off, but until the later parts of the 19th century, those lands were wild and untamed. There was nothing at all to prevent wild animals or grazing cattle--many of them large enough to derail a train--from wandering out of the tracks. In Europe, by contrast, much of the land through which the railroads were built was already privately owned. Much of the rural lands were already divided into pastures, and the shorter distances involved, compared to the tracks built in the United States, made it much more practical for the railroad companies to fence off their property completely. Thus, the locomotive designers did not have to content with removing anything more than small debris from the track. 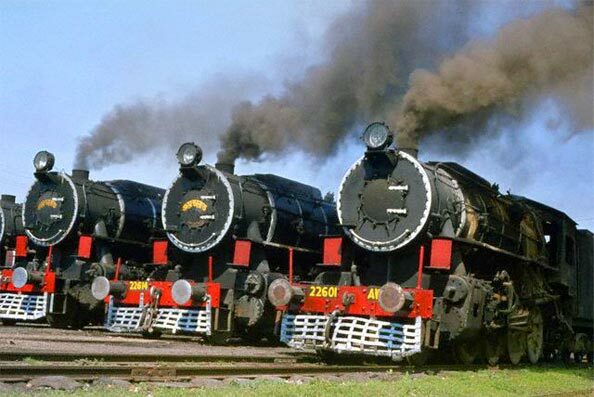 The American locomotives developed their large, bulbous smokestacks because the preferred fuel in North America until the turn of the 20th century was wood--not coal, as in Europe. Wood gives off a much dirtier smoke than coal, and also tends to throw up sparks and embers. These posed a potential hazard, as they could quite easily set grass and property near the tracks on fire. 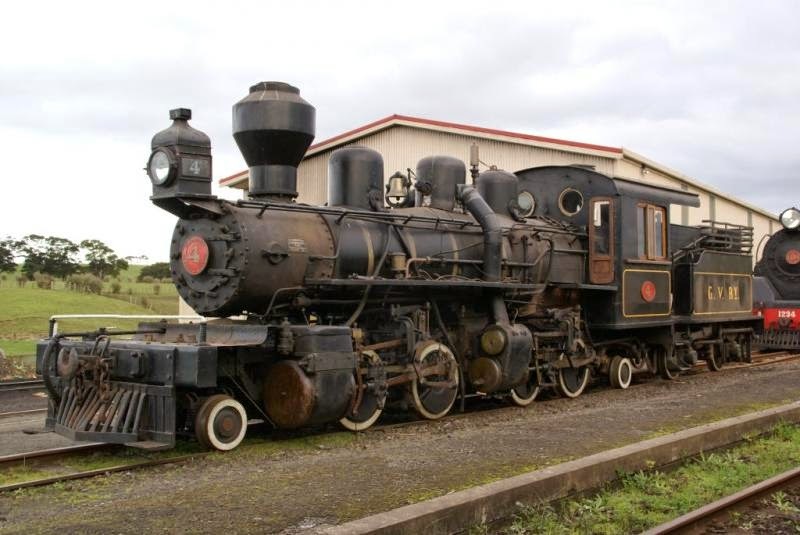 The American locomotive designers also had more leverage to build to greater heights since they were generally not, as was the case with their British counterparts, designing machines that had to work around existing structures. The headlight on the American locomotive is also quite noticeably larger than the one on the British locomotive. Again, this goes back to the fact that large stretches of the American tracks ran through wilderness areas. The crew had less light from adjacent cities, and had a greater need for forewarning as there was more chance of an obstruction on the tracks. British engines had one or two small lanterns, which were removable and placed in a different location to indicate what sort of train the engine was pulling. Moving slightly back towards the cab, the British engine has no visible pistons. They are tucked under the frame, giving the locomotive a sleek, slender profile compared to the American version. Some designs featured a third piston, nestled all the way into the frame. Many British and European engines designs do place the pistons outside the frame, especially those that date towards the end of steam, but they tended not to protrude out much farther than the width of the frame. American locomotives, by contrast, did not use the in-frame piston design--because of those long distances, they simply needed more power than this design could provide. Finally, let’s talk about the cab itself. The American locomotives tended to have larger cabs that were completely closed off from the outside. Again, this goes back to the fact that the crews traveled over longer distances, and required greater protection from natural elements and sparks coming out of the smokestack. British locomotives usually had a cab that was shielded in the front and had an overhang to cover the crew’s head, but were otherwise open in the back. Some designs had nothing more than a short barrier, somewhat like a motorcycle windshield. Because the crew could easily lean out and look around the front, the windows were usually small and iconically round. The only differences that are as far as I know completely cosmetic are the opening to the smokebox doors, and the sound of the whistle. American engines often had a row of thick bolts to keep the doors fastened tight, but engines across the Atlantic typically had one round handle, or two straight ones that gave the face of the locomotive a “clock dial” appearance. The European engines typically had high, single-noted whistles, but the American locomotives typically had much lower-pitched whistles that might sound three or more different notes (also called “chimes”) at the same time. These differences remained readily apparent right up until the end of steam, though the size of the smokestacks and cowcatchers on the American engines shrank as locomotives began to use coal and oil for fuel, and the frontier was parceled off to private owners. The real proof of the geography-influencing-design theory, however, can be found outside of the British vs. American paradigm. In less politically dominant nations, the specific geographic needs either encouraged imitation of one style or the other, combined the two, or prompted designers to create something completely unique to the region. This is a picture of a Russian locomotive. Although locomotives there were generally built by local shops, they bear a striking similarity to the American designs. Chalk this up to the fact that travel in Russia involves the same primary challenge as it does in North America: long, underpopulated distances. Here, too, the rugged locomotive designs reflect that the machines must travel over prolonged distances with few opportunities to refuel. This locomotive is from China, where, again, large expanses of land and harsh climates produced a design almost identical to similar examples in Russian and the United States. Finnish steam is fascinating to me, because not only are there quite a few surviving examples in the present day, their locomotives are almost perfect hybrids between the American and British styles. Looking at this picture, you can see quite a few telltale signs of European designs--rounded windows, hidden condensing pipes, a single-chime whistle, and two removable lanterns. The large smokestack and full cab, though, reflect that Finland is a cold and heavily forested country, and wood is the most abundant natural fuel. Distance, however, was less of a defining factor--note how stubby the tender is compared to the engine! 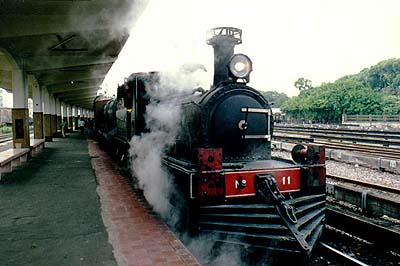 These locomotives are from Argentina and New Zealand, respectively, and show another example of the two styles being hybridized. They run on coal or oil and they have a generalized European look--both of these countries were European colonies at one time-- but both have the large headlights and cowcatchers to run over more rugged terrain. Come to think of it, you can get half way to placing a locomotive just by looking at the cowcatcher, if it has one. The slats on American locomotives were almost always vertical-- not horizontal or woven as you see in engines from India, China, and other continents. Garret locomotives--which have a boiler in the center and articulated pistons on the front and the back--are in a class all of their own. Although they were developed in England, they were used most frequently in Africa, and occasionally in Australia and Asia.